A Japanese show dedicated to the health niche has recently increased the demand for barley worldwide. According to one of its programs of last year, one of its hosts had a segment on barley where the focus of the topic was on the many health benefits of barley. 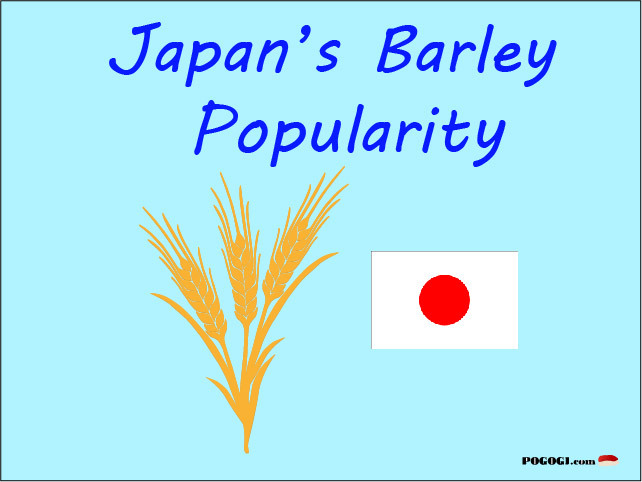 This prompted many locals buying up barley across Japan thus driving up demand for more imports from countries like the United States. Many Japanese bought Barley to either mix it with rice or use it completely to replace rice because of its suggestive benefits for the health. This is a pretty big thing to even think that something can replace rice as it is a major staple and is used in many different ways. The founder of McKay Seeds from the state of Washington has mentioned in a recent interview that the demand for barley has jumped 3 times in the last year. Many global companies are trying to meet the demands of this new growth. The type of barley that considered the main variety is called BG 012, which requires a lot of rainfall and is considered a short plant. At the moment they are looking at taller plants species that will produce higher yields in order to try to meet the demands for the upcoming years. So What Are the Benefits of Barley? It is considered a whole grain providing important nutrients such as vitamins, minerals and fibers. Bread is the most popular form of consumption. Your bone health will increase, since it contains magnesium, zinc, calcium, phosphorous and iron. This is very important because bone mass will decline after the age of 35 and the rate will increase in later years. The possibility of having osteoporosis will be higher if you do not consume the right nutrients that will help strengthen your bone as you age. The ingredients that help with your blood pressure that is found in barley are that of magnesium, calcium and potassium. There is evidence that it will also help with those wanting to maintain weight and magnesium itself is excellent for your heart. Magnesium has shown to help with blood vessels, reducing heart spasm and reducing the risk of blood clots. According to a leading magnesium expert (Dean, MD, ND), she mentions that up to 80% of the world’s population is deficient for this mineral. One special ingredient found in barley that has a profound effect against reducing the risk of certain infectious disease and cancer is selenium. This mineral is found in barley and helps detoxify compounds found in our bodies that are capable of causing cancer. With the help of selenium, it improves our immune system in order to fight these rogue cells before a tumor can be formed. Supposedly it also helps with fertility in both genders. According to one paper, it is estimated that around 750 million people suffer from a deficiency of selenium. Everybody loves tempura as it is a household name in many Japanese restaurants across the world. Who doesn’t love the warm crunchy taste of shrimp or yam tempura? Flowing Somen is one of the most fun approaches to eating cuisine that you are likely to see. Somen are a popular type of Japanese noodle made from wheat flour and salt. Green tea is a very popular beverage and one reason for its popularity is because of its health benefits.